Room Separator "Center (Pink) II [Room Dividers]"
Room divider "Center (Pink) II [Room Dividers]" is a particular decoration for modern flat. room divider screen "Center (Pink) II [Room Dividers]" made from wood and printed on both sides will lookideally in beauty salon, hair salon or other commercial space. Room divider "Center (Pink) II [Room Dividers]" will not only help you to manage space, but it can also be a unique interior decoration. Room divider "Center (Pink) II [Room Dividers]" can be made of 3 or 5 elements, which are connected with metal hinges. 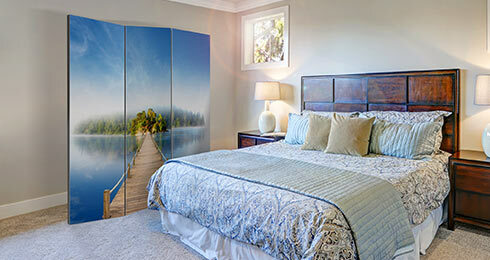 Every room divider part’s dimensions are 45x172 cm and are printed on both sides. Thanks to that room divider "Center (Pink) II [Room Dividers]" is very adjustable and it’s also a stylish decoration, which will look ideally not only in your beauty salon, but also in restaurant. Dividing waiting room from office, kichenette from sitting room, creating wardrobe in your bedroom – there are so many inspirations of how to use a room divider! in your interiors! Room Divider "Feathers (Pink) II [Room Dividers]"
Room Divider "Center (Green) II [Room Dividers]"